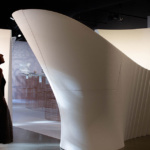 To the late Zaha Hadid, “math was like sketching.” Since her death, this attitude to architecture and design has been continued by her firm, ZHA, chiefly through ZHCODE, a computation and design research offshoot set up in 2007, the work of which is currently on display at The Building Centre in London. 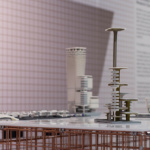 Borrowing theorist Mario Carpo’s terminology, the exhibition at The Building Centre is titled Digital Turn and showcases ZHCODE’s methods and ideas while exploring how digital tools have changed our ways of making and thinking. This is the second of two in a series of exhibitions. 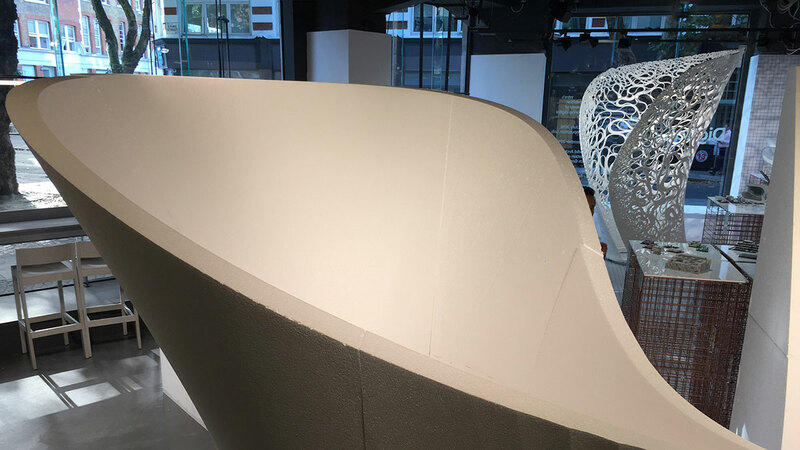 Earlier in the year, Digital Turn had showcased the academic work of The Bartlett’s Design Computation Lab. Digital Turn is divided into two parts: tectonism and semiotics. 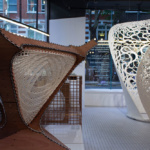 The former looks at the structure and geometry of digital fabrication, while the latter examines the physical results of this and its relationship to various contexts. 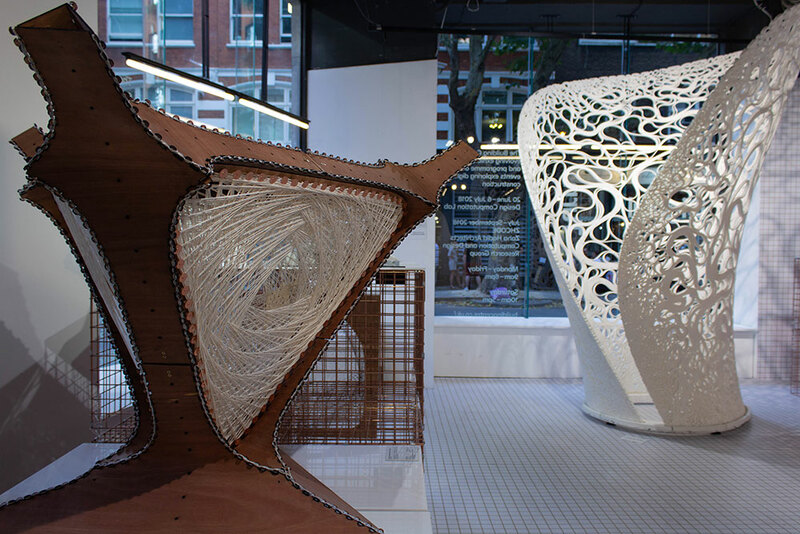 This setup essentially translates into parametric design versus algorithm and data-driven urbanism. 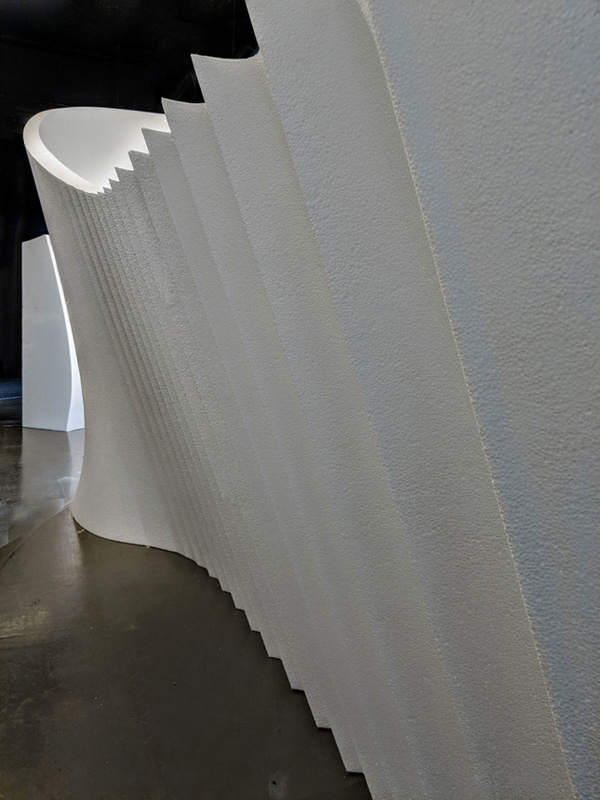 Visitors to the gallery are welcomed by full-scale white EPS foam offcuts, called “foam grottos.” The undulating formwork, made from robotic hot wire cutting, is indicative of ZHA’s sinuous style and serves as a threshold to the exhibition space while being a cue for what is to come. 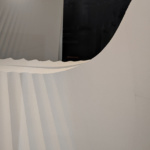 Part of the exhibition is dedicated to the recently completed Winton Gallery at London’s Science Museum. 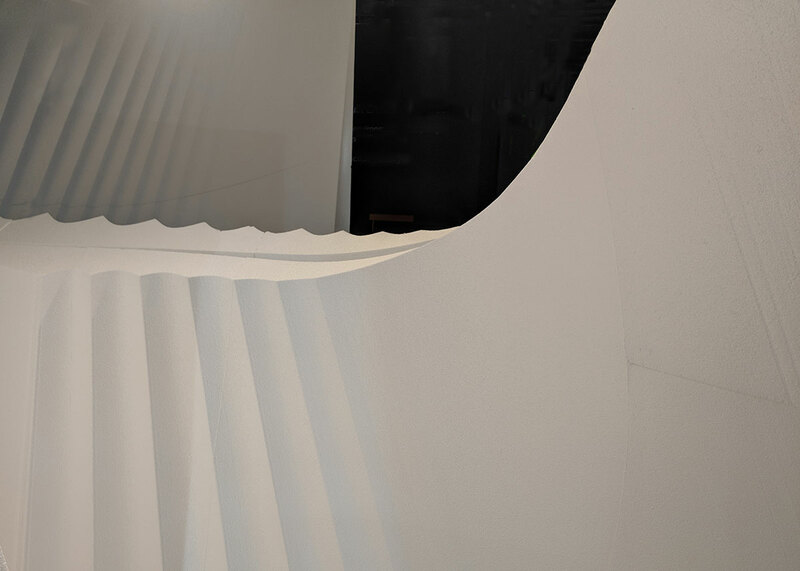 Building on the work of Frei Otto, ZHA’s studies into the “minimal surfaces” of 3-D objects informed the design, with a triangle-based pyramid being “reduced” (read: imploded) to a curvaceous hanging module which served as a circulation device, as shown in image at the top of the page. 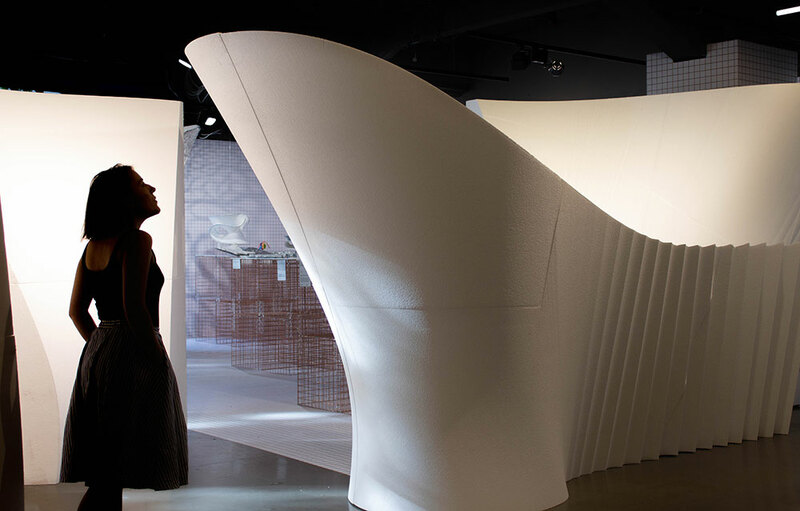 Showcasing the Winton Gallery, however, also reveals how parametric design does more than just produce fancy curves. It also serves as an organizational tool. The aforementioned floating module was used in tandem with a circulation strategy derived from the airflow around a biplane. 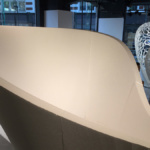 Naturally, this airflow diagram produced countless curves, but it also allowed ZHCODE to produce massing studies for objects in the gallery that align with it. 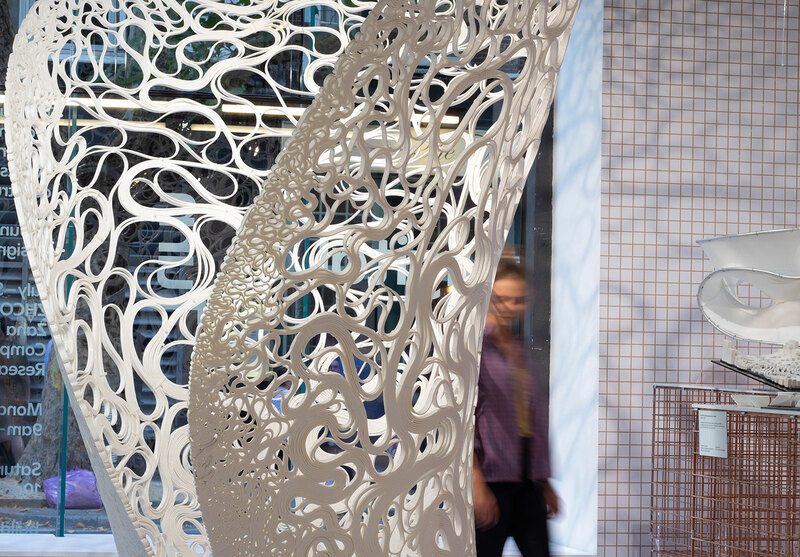 This kind of design process has also been scaled by ZHA in urban studies that derive from an algorithmic input. In one example, a computer program located potential infill sites in London, identifying “end of block” plots of land, or sites that can be found at the edges of tower blocks. As a result, it proposed that housing be built on these underutilized areas. 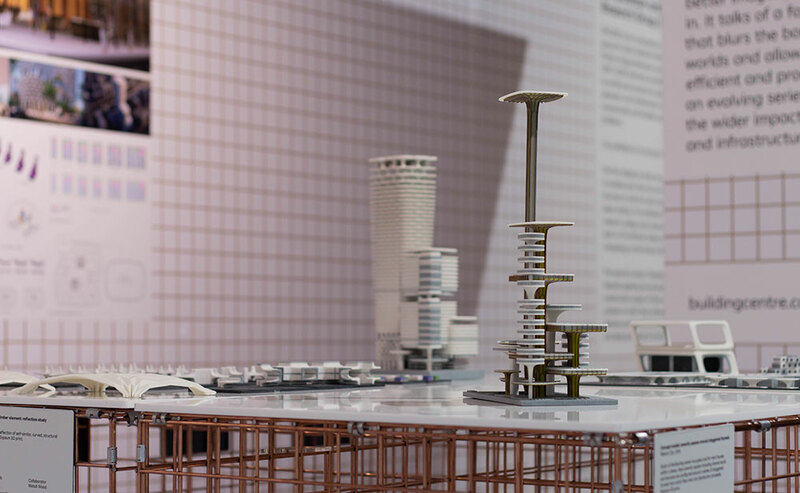 Another notable example is an exploration into modular housing. By using a uniform lattice structure, residents can customize their dual-aspect unit’s facades, adding balconies or changing the window type in the process. It’s basically Alejandro Aravena’s half houses scheme but for the wealthy. And it’s that latter notion which, when coupled with derisory remarks from the current head of ZHA, Patrik Schumacher, on social housing and desire to privatize cities, leaves a bitter taste in the mouth. 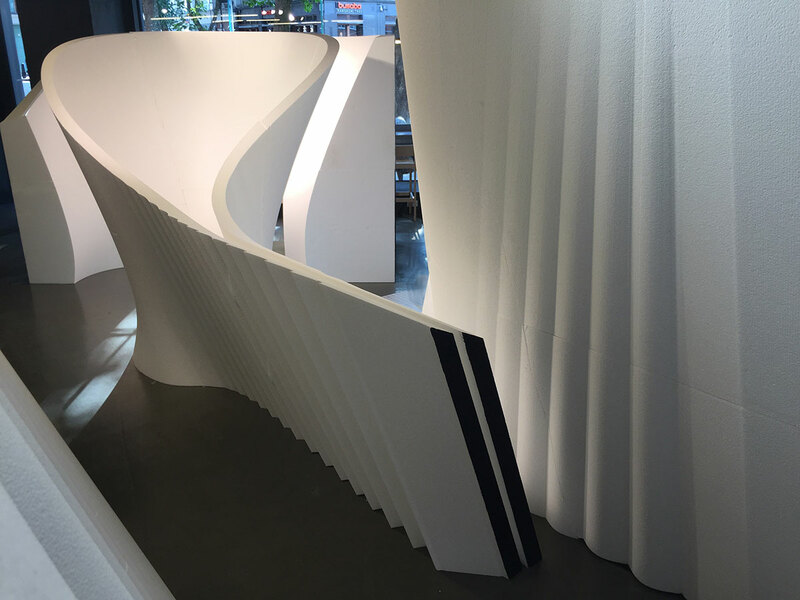 Furthermore, the often overtly abstract nature of parametric architecture, an architecture reserved for museums, corporate headquarters, luxury hotels, and extravagant condominiums, doesn’t counter this sense of elitism either. 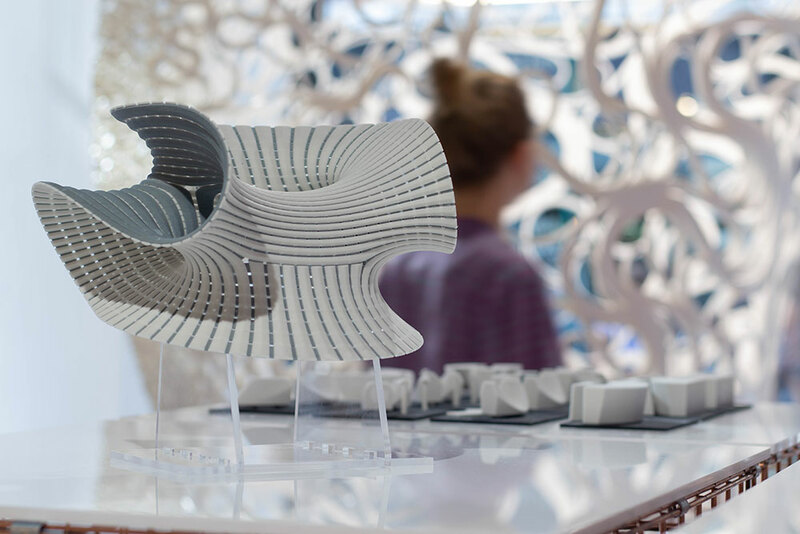 A welcome palate cleanser can be found in another exhibition at The Building Center from Royal College graduate Hannah Rozenberg, who won this year’s Student Prize for Innovation. Her book, Building Without Bias: An Architectural Language for the Post-Binary illustrates how artificial intelligence isn’t always right and is even sometimes racist, as demonstrated by Microsoft’s “Tay” bot which ended up making racist, misogynistic, and genocidal remarks on Twitter. If a Twitter bot can do that, who’s to say an urban planning bot wouldn’t start redlining? 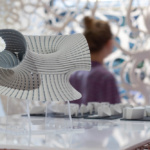 Does Digital Turn subsequently highlight that, while parametric design may be an incredibly useful design tool for both making and thinking, its urbanistic potential is something to be wary of? The Building Center responded to this. “ZHCODE’s algorithmic design work on display in Digital Turn showcases the most advanced algorithmic design taking place today,” it said. “For example, the computational study series exploring housing liveability measures shows how advanced algorithmic methods of design generate a formal outcome that guarantees multiple desired conditions are synthesized in a single solution to a particular site. 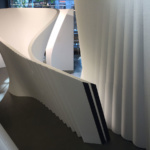 The digital design method therefore provides the designer/architect with sophisticated options to site-specific problems.